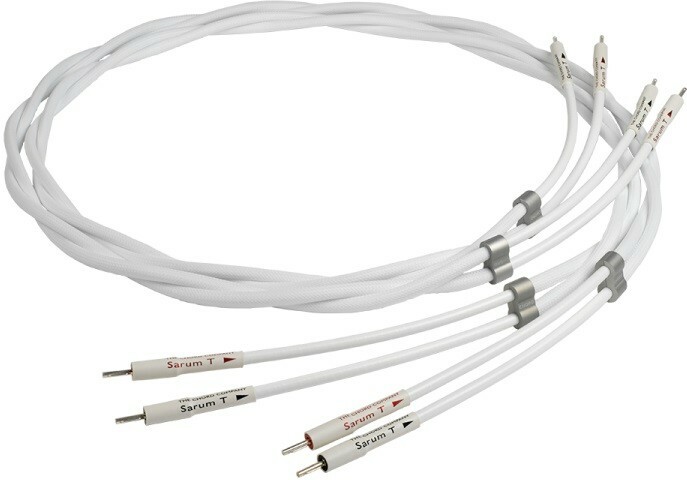 Chord Sarum T is a speaker cable that will carry information down to micro dynamic and micro tonal detail extremely accurately, it is available in four factory terminated lengths. Chord Sarum T is a speaker cable that will carry information down to micro dynamic and micro tonal detail extremely accurately over any length. Chord Sarum efficiently acheives the aim of any speaker cable designer which is to produce a cable that allows as much information through as possible while at the same time ensuring that the cable has a neutral tonal signature. 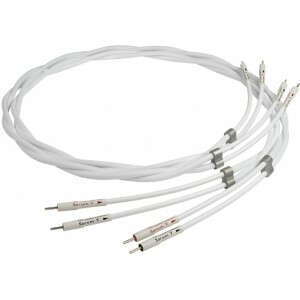 Sarum speaker cable uses very high quality silver-plated copper conductors and lots of them. It’s a heavy speaker cable with an extremely low resistance measurement. The really impressive thing about Sarum speaker cable though is its ability to disappear into any system it’s used in. Its signature is fundamentally neutral, so what you will hear is your speakers and electronics, not the speaker cable. Fit Sarum speaker cable to any speaker, either stand mounted or floor standing, and start properly discovering the performance of your system and the power of your favourite music. Use it with Tuned ARAY interconnects and you’re going to get a truly musical sound that borders on magical. Because of the complexity of construction, Sarum speaker cable is only available in factory-terminated lengths. Each set of Sarum speaker cable is produced to order and although the conductor pairs are separately shielded, the cable is twisted along its length in order to improve flexibility. Each end of the cable is secured with an aluminium clamp, designed to hold the cable securely but not to compress the conductors. Experiments showed that compressing the shield and insulation on either speaker or interconnect cables altered the characteristics of the cable and subtly degraded performance. Sarum speaker cable will do what really really good speaker cables do. It will let you hear what your system is doing. It will add nothing (in terms of unwanted colouration and noise caused by interference) and take nothing away (detail, dynamics of all sorts, timbre, tone). It’s as coherent as your system. It’s pretty close to invisible. There is something very special about a system fitted with Sarum Tuned ARAY interconnects and Sarum speaker cable, but even as the only Sarum cable in a system, Sarum speaker cable produces profoundly musical improvements.